In addition to the hotels listed on the previous page, the following offers a range of food styles at a range of budgets. We are lucky on Little Corn to have a great variety of eating options in such a small island, not to mention of course buying a loaf of steaming hot fresh coconut bread and making your own food! Local beers are usually $2 or less and rum drinks $3, with happy hour specials available in some places. Late breakfasts, lunches and dinners, this popular beachfront cafe serves great burgers, Fish Tacos, Smoked BBQ and a lot more. At night you’ll find twice weekly bonfire parties and people swapping stories about their day over cold beers and a range of cocktails. WIFI available. Open Mon-Sat 10am til late, happy hour 5-7pm. Snacks $3-$5, meals $5-$10. Located on Cocal beach a short 13 minute walk from the village (follow the signs) one of Little Corn Island’s and Nicaragua’s most highly ranked restaurants (with free WIFI access for all customers!) offers tasty breakfast from 7:30am to 10pm (starting at only $2.9), mouth watering lunches from 12 to 3pm (starting at only $4.9) and delicious, almost gourmet 4 course dinners from 5:30 to 8pm (starting at only $9). Snacks start as low as $2 and are served from 11am to 4pm. 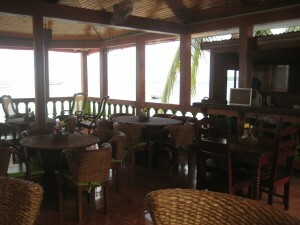 Beautiful beach setting, isolated tropical island elegance, great service and fast service times combined with a friendly helpful staff make this a popular dining and cocktail place for singles, couples, friends and families. Only place on island with kid menu’s also many vegetarian and some vegan offerings. Also serving semi famous Pina Coladas, huge Margaritas, frozen frappacinos and more. See reviews here. Cafe Desideri – Italian owned cafe/restaurant with pastas, fish, meat and a range of fantastic desserts, its not unusual to see people coming for the desserts alone, they are that good! Now also serving healthy breakfasts from 7am. Enjoy a glass of wine with your meal whilst looking out over the beach at the sunset. Wi-fi also available. Open Tues-Sun from 7am till 10pm. Breakfasts $5-$6, meals $6-$18. The Shack – On the main path close to other restaurants and stores, The Shack offers reasonably priced snacks as well as full meals. The very helpful Rodcliffe will gladly cook meals to your own specification, which may appeal to vegetarians and those not wanting a huge meal. You can also arrange fishing trips here and Rodcliffe will cook your catch for you afterward. Also offers the typical island dish Rundon, which should be ordered in advance. Open every day from 6.30am, perfect for those who want to eat before their morning dive or fishing trip, open until 10pm. Breakfasts $4-$6, meals $5-$10. 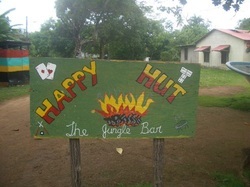 Happy Hut – Set in the woods just behind Tranquilo Cafe, Happy Hut plays local music and has recently opened up to the outside seating area. Open randomly it seems…. look out for special night speaking to the locals to find out what’s happening!